Devil’s club leaf shoots are the ultimate seasonal treat – they’re edible for only a few days a year and taste wonderful. They have a resiny, almost piney, odor when first picked that is tamed, but doesn’t dissipate entirely, when heated. Cooked devil's club shoots have a uniquely energizing and complex flavor that tastes like nothing else I’ve ever eaten. In spring, I check the devil’s club on our property daily, anxious lest I miss the narrow harvesting window. Once they’re ready, we immediately head out with bags and baskets in hand to pick our fill of this unusual spring green. When I mention how good devil’s club shoots taste, I often get looks of disbelief from those who have fallen victim to the spines that cover its stalks and the underside of its giant leaves. Sautéed Devil’s Club Shoots go well with Crispy Chicken with Roasted Garlic, any seafood or poultry dish, with pasta, or on their own. 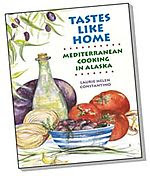 This is my entry for Weekend Herb Blogging, hosted this week by Cate of Sweetnicks. Wow! I grew up in Alaska, and went to great effort to avoid devils club at all cost. It never once occurred to me that you could eat it. So interesting, what a great post! Of course whenever I hear about something unusual like this, I always wish I could taste it! Every time I come here, I learn something new. Laurie, you could give David Attenborough a good run for his money! But you're better because you can cook!..LOL I'm learning so much from you. I had never heard of Devil's Club shoots and I find it all very interesting. Thank you again for an interesting horticultural read. when i saw how huge they are in the first photo, i thought you could harvest as much as you want to eat, and freeze enough to serve up right throughout the winter! Judy - you're right - it's a form of revenge for having to put up with devil's club the rest of the year! Kalyn, yes, it's just how I feel when I read certain Asian or Indian recipes. Sam, I think there's good foraging pretty much anywhere. It's just a matter of learning about the wild plants in your area. Suganya, thanks for stopping by! Joanna, yes, I included the chicken recipe just so there'd be something for everyone! Maria, those giant leaves have giant spines all over their undersides - it's a very agressive plant. I think you better start planning a trip to Alaska! BTW-beans went in last week as mentioned and also, somehow I see foraging in my future! Like, Cheryl, I was wondering about who was in the photo. I somehow read the caption as "Teeny-Metcalfe-Treadwell Mine" which seemed like kind of a long name for a mine, but who knows how they name things up there in Alaska? By the way, Laurie, I meant to mention that your instructions for gathering this are very nice and clear. I'm confident that if I were to find myself in the Pacific Northwest at the appropriate time of year I could gather some. Oh sure, I'd injure myself despite your instructions, but it'd be worth it! Cheryl and Lulu - no that isn't me in the picture - it's my friend of 35 years who is named Teeny Metcalfe. And she is a classy lady! Cheryl, I'm glad you planted your beans - I was worried about you! Lulu, I'm glad the instructions were clear, but I'm thinking next season you need to find the devil's club that grows in California. It really isn't hard to gather this without hurting yourself - you just need to pay attention to what you're doing. And, in Alaska, wear a little bug dope! I picked a little for the first time today, along with a few fiddleheads and some fireweed, and sauteed them up in butter with garlic and onion. The devils club was the most delicious part of the whole dish, so I went out and picked a couple pounds of them (and stumbled on three morels too). I'm looking forward to experimenting with them. i got so scared reading about all those spines. i am constantly amazed by all the foraging and wonderful edible plants you have in your backyard. i'm inspired to go on some bush tucker trip into the aussie outback to see what i can find! Hi Laurie, love this post! I had never heard of the devil's foot and am intrigued! Paul, your post made me so happy to read. I've been trying for years to convince people that devil's club shoots are a special treat, but people are too afraid to try them. 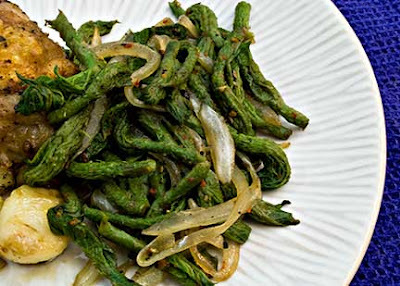 They are really one of my favorite spring greens and I enjoy mixing them with other spring edibles as you have done. Thanks for letting me know you picked them; it made my day. Anna, don't be scared - just be careful! I hope you do go on a "bush tucker trip" - there are terrific wild edibles pretty much everywhere. Syrie, aren't you in Vancouver B.C.? 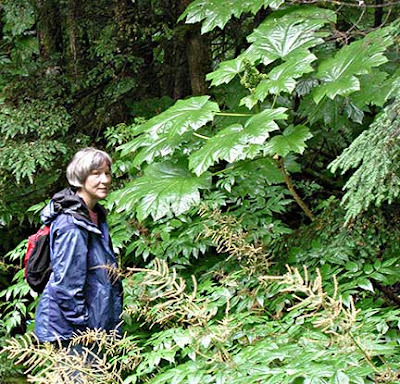 I'm positive that devil's club grows wild in British Columbia - you should go on a collecting trip next spring (it's too late in BC for this year's gathering - the leaves are already out there)! Another great post about something I now feel compelled to try out. 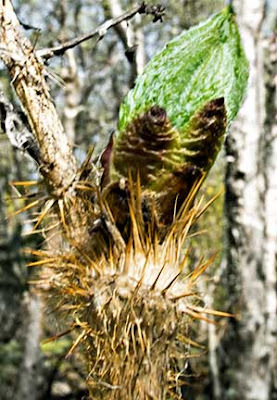 At the back of my mind I know I have read about Devil's club before but have never seen it up close or even tasted it. Interesting post!! This post scares the heck out of me. Bravo you! Now I really want to try just to see what they taste like. I'm sure they're wonderful to you after all you went through to harvest them. Thanks for sharing , Devil club is new to me. Could you explain alittle more on it compared flavor?